Dry Patches On Your Lawn? During periods of dry weather, a build-up of fungus around soil particles may have the effect of repelling the water droplets in the soil. 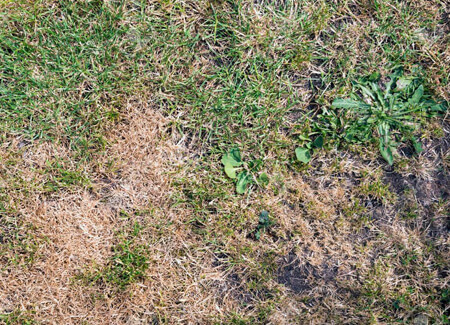 This can lead to dry patches on your garden lawn. A severe case of dry patch will result in the soil becoming almost incapable of absorbing water, and any rain that falls will run across the surface of the soil like rain on a glass plate. Your lawn will then continue to deteriorate because no moisture is reaching the roots of the grass. Cases of dry patch are recognisable by the ink stain-shaped brown patches that appear on the lawn. Aerating your soil via spiking or hollow time aeration – combined with the application of a wetting agent to tackle the fungal disease – will improve the water absorption properties of the soil and boost the health of your grass. Dry patch is an increasingly common problem in the UK, especially during dry and windy summers. If you’re noticing dry grass patches in your lawn, Lawn & Weed Expert can help – we have more than 20 years of lawn care experience, and we have the knowledge required to identify your lawn problems and select the best treatment for the job. Contact us today to arrange dry patch lawn treatment – our services are available in Cardiff, Swansea, Newport and across South Wales.